[Stride]-Stride Step-[Choose one or more cards with the sum of their grades being 3 or greater from your hand, and discard them] Stride this card on your (VC) from face down. 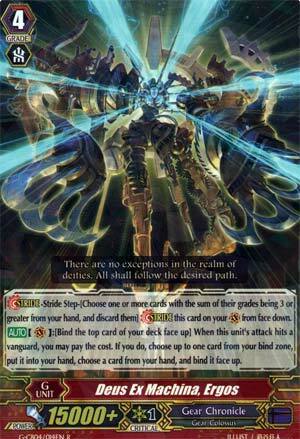 [AUTO](VC):[Bind the top card of your deck face up] When this unit's attack hits a vanguard, you may pay the cost. If you do, choose up to one card from your bind zone, put it into your hand, choose a card from your hand, and bind it face up. Needs to hit and doesn't even +1 you. Binds are nice though I guess. Decent utility first stride for Chronofang and Gear Colossus decks. On-hit, you grab something in your bind zone and then bind something from your hand. The on-hit effect is nice, because some of the effects you use in the aforementioned decks bind the top card of the deck randomly, and since that's not controlled by you, you might have bound something you actually wanted in your hand. On-hit first strides kind of get a free pass with me. On the one hand, they're on-hit reliant. On the other hand, your follow-up strides get much deadlier if your opponent decide to waste a PG on your silly on-hit first stride (and don't draw into another PG). If the opponent wants to waste guard on this, they're silly.